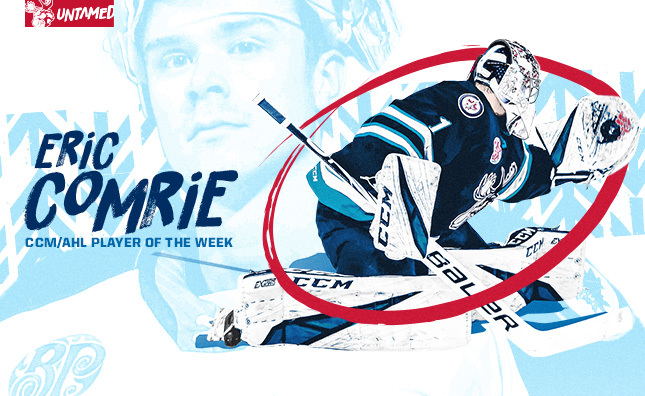 The Manitoba Moose Hockey Club, in conjunction with the American Hockey league, announced today goaltender Eric Comrie is the CCM/AHL Player of the Week for the period ending Jan. 20. Comrie, 23, posted a 4-0-0 record last week, leading AHL goaltenders in wins, saves (131) and minutes played (244). The Edmonton, Alta. native allowed just seven goals, while featuring a 1.72 goals-against average and a 0.949 save percentage in his four starts. Comrie made 34 saves, including five in overtime, in a 3-2 win over Milwaukee on Monday. He was named the game’s third star on Wednesday, turning aside 31 Milwaukee shots in a 4-2 victory. Comrie then made 37 saves on Saturday, 19 of them in the third period, to shut down the San Antonio Rampage in a 4-1 victory, while being named the game’s first star. The fourth year pro turned in another first star performance, leading Manitoba to a 4-2 win on Sunday, making 29 saves. Since returning from the holiday break, Comrie holds a 7-2-1 record in 10 starts, while recording a 1.79 goals-against average and a 0.948 save percentage. Overall, the Winnipeg Jets’ second round pick in 2013 is tied for third in the AHL with a 0.923 save percentage, while facing more shots (943) than any netminder in the league. He is tied for fourth in the league with 15 wins and ranks 12th in the AHL with a 2.65 goals-against average. In recognition of being named CCM/AHL Player of the Week, Comrie will be presented with an etched crystal award prior to an upcoming Moose home game.